A spectacular second terminal at Cebu airport not only raises Philippines’ airport infrastructure to world-class standards, but is also driving international and domestic tourism to Cebu City, one of the nation’s most significant historical and cultural centres. The improvements provided by the new Mactan-Cebu International Airport Terminal 2 (MCIA-T2) should not be underestimated. Until its inauguration in July this year the previous main arrival hall was at the Ninoy Aquino International Airport in Metro Manila, which has consistently made the list of the world’s worst airports. MCIA-T2 might just be one of the best, and is positioning itself convincingly as a significant tourism hub. Cebu City is no newcomer to the tourism industry. In 1998 it hosted the Asean Tourism Forum, and in 2002 the city also hosted the East Asian Tourism Forum, of which the province of Cebu is a member and signatory. But the level of investment in MCIA-T2, along with tourist numbers that are increasing by the day, will set a new economic high tide mark for the the seaside city. Last year 10.5 million passengers, both domestic and international, passed through the gates of the old Terminal 1 at Cebu airport, a 14 per cent increase on 2016. Air traffic was also on the climb, up 21 per cent to 86,380 aircraft movements. In 2016, the figures were similar: domestic flights up by 17 per cent to 21,070, with international flights rising at double that rate, soaring from 15,739 to 21,070. On a practical level there is little doubt MCIA-T2 will deliver a return on the investment. Tourist numbers are up and passenger congestion is greatly reduced delivering a much better passenger experience than previously. On a symbolic level, MCIA-T2 represents a doubling-down of President Rodrigo Duterte’s ambitious “build, build, build” policy — a 10-year, PHP9.4 trillion (about US$180 billion) infrastructure-building spree, the likes of which has not been seen since the Marcos era. President Rodrigo Duterte and a few officials take a tour inside the Mactan-Cebu-International Airport Terminal 2 (MCIA-T2) 2 during its inauguration Simeon Celi Jr. The P17.5 billion (US$330,000,000) MCIA-T2 project was implemented by the Department of Transportation (DOTr) and Mactan Cebu International Airport Authority (MCIAA) under the Asian Development Bank’s (ADB) public-private partnership (PPP) framework. Designed by Hong Kong-based architectural firm Integrated Design Associates, in partnership with local architects and designers Budji Layug, Royal Pineda, and Kenneth Cobunpue, the new airport borrows themes from its coastal surroundings. Travellers feel like they are making a stop at a beach resort to shop, relax, or wine and dine. Its iconic timber arches are inspired by the waves of the seas around Mactan Island. Aines Librodo, head of Airline Marketing and Tourism Development of GMR-Megawide Cebu Airport Corp. (GMCAC) told media on a tour of the MCIA-T2 that it was the first airport structure globally to use so much wood. “No airport anywhere in the world has used these kinds of material”, he said. “The glulam (glued-laminated timber wood from Austria) is much stronger and I think 20 to 30 per cent more expensive than the usual steel, and has a life of 200 years. But every 50 years, it has to be polished with a certain special liquid to cure the wood”, he added. In the first nine months of this year Mactan-Cebu International Airport recorded passenger growth of 8.6 million compared to 7.5 million in the same period last year, as a result of aggressive airline marketing to position it as a domestic and international tourism hub. The refurbished MCIA-T1 is now the country’s second largest air terminal, covering 65,500 square metres ( 705,000 sq.ft.) of land area and hosting 26 airlines that fly to 25 international and 30 domestic destinations. 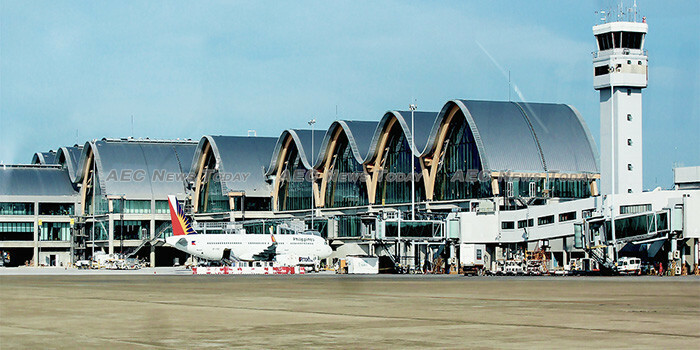 GMR Megawide Cebu Airport Corporation (GMCAC), a Filipino-led consortium of Megawide Construction Corp., and GMR Infrastructure, won the 25-year bid to build, operate, and maintain (BOM) the new terminal. In 2017, the consortium submitted a PHP208 billion unsolicited proposal for a 50 year development of Mactan-Cebu International Airport.